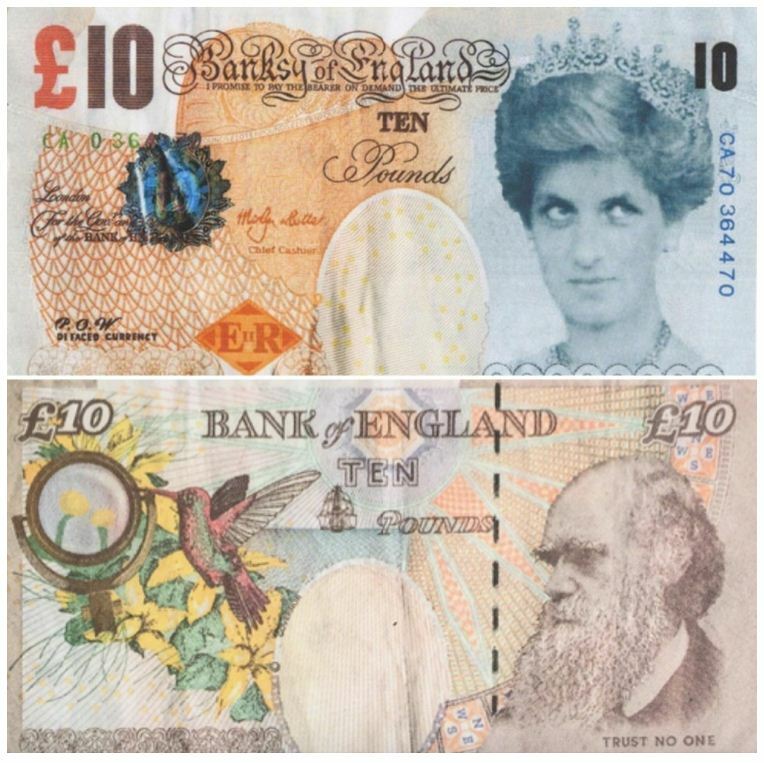 In 2004 Banksy produced a 100 thousand such false 10-фунтовых banknotes with Princess Diana and scattered part of them in the crowd at the Notting-Хиллском the carnival and the music festival in reading. The title of the work "Di-faced Tenner" is built on a play on words, where the term "Defaced Tenner" ("tainted ten") replaced by "Di-faced Tenner", i.e., literally, "Ten with a face of Di [Uruguay]". The inscription "Bank of England" in these notes is replaced by "Banksy of England". On the reverse side, under the portrait of Charles Darwin, the call to "Trust No OPE" — "trust No one". Shortly after the crowd fell from the sky banknote, Banksy, many tried to pay with them in shops, and who-то it even worked. Realizing that thus fake currency really got into circulation, Banksy banknotes with Diana no longer distributed. Instead, the organization of Pest Control efforts to authenticate Banksy's work, was to stick on their certificates of authenticity half "Di-faced Tenner", and the second half to keep. Now Pest Control presented a single bill with lady Di as a gift to the British Museum. And gift the Museum has received, but has not included it in the Department of graphic art and prints (as expected), and in the Department of coins and metals. This is the first work of Banksy is included in the collection of the British Museum. However, about 15 years ago, Banksy has been exhibited in this Museum. However, then it occurred without the knowledge of management. 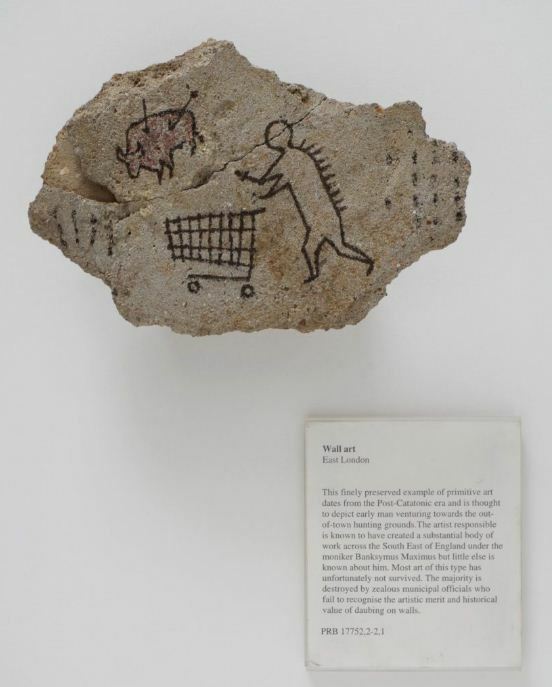 In 2005, he placed the fragment of "rock art" in the exhibition of the Department of Roman Britain accompanied by an explanatory plaque, copying the style of Museum labels of the British Museum. False exhibit staff found only three days later. "Pecherskom stone" depicts "ancient" hunter with a supermarket trolley. Subsequently, Banksy asked for your job back, and employees of her then happily returned.